The Bahá’í Gardens at Bahjí in ‘Akko form a wide circle surrounding the historic mansion where Bahá’u’lláh, the Prophet-Founder of the Bahá’í Faith, resided during the final years of His life and the shrine where His remains were laid to rest. 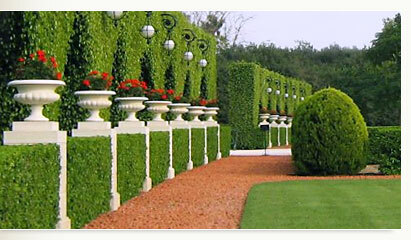 The approach to the circular garden is a long, straight path framed with cypress trees and informal plantings. As you walk, the silence seems to grow in intensity. Entering the heart of the site is like arriving in a world of peace and serenity, a wall-less sanctuary that is protected without being enclosed. Here the formal, precise gardening flows around historic buildings and natural elements that include a centuries-old sycamore fig tree and the remains of an ancient olive grove. The Bahá’í Gardens in ‘Akko are open from 9:00 to 16:00, seven days a week, but they are closed on Bahá’í holy days and Yom Kippur. There is no charge for entry and no need for a reservation. For the most complete experience, we suggest you visit on Friday, Saturday, Sunday or Monday between 9:00 and 12:00 noon. During these times, you can enter the inner garden and visit the shrine, if you wish. The rest of the time, it is possible to walk through the extensive outer gardens and view the heart of the site from the perimeter path, without going inside. Tours may be arranged in advance for organized groups of 18 people or more and those with special interests. 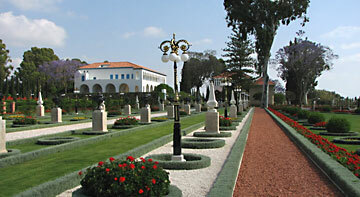 The Bahá’í Gardens in ‘Akko are located at the northern edge of the city. The entrance is near the North ‘Akko intersection on National Road 4, at the end of the old access road to Kibbutz Shomrat. The shrine and the inner gardens are open only on Fridays, Saturdays, Sundays and Mondays between 9:00 and 12:00 noon. ‘Akko is a truly Mediterranean city, made unique by its extraordinary location, five millennia of history, and two World Heritage Sites recognized by UNESCO. The Bahá’í Gardens are one of them, and the other is the Old City, with its magnificent crusader halls and Ottoman mosques, caravanserais and fortifications. ‘Akko is also the gateway to the Galilee, where you can find overnight accommodations and many interesting places to visit. More information can be obtained from the Old Acre Development Company, among other sources.